One of the Keys to the art of persuasion is your ability to Re-frame prospects and kill objections. Perspective is everything. Many times people have objections because their point of view is off. This video will help you to shift the point of view of almost everybody and eliminate objections before they come up as well after they already have. Take notes this video is killer! How to Toast Objects and Close like a pro. In this training you will learn how to cut through smokescreen objections, isolate the REAL objections, overcome them, and then close with ease. People think closing is something you do to people. Closing is something you do for them. Most people would love to get involved with you offer, but fear is holding them back. This training will help you overcome those fears, so they can make the decision that’s right for them. This advanced closing technique is one of the best of the best. When all objections are handled and you just want to cut to the chase and get to the bottom line. Nothing transitions smoother to a “Yes” than these 4 questions! When you ask these four questions after all of your prospects questions have been answered and their objections, if any, have been overcome you will easily find yourself making that smooth transition into the closing portion of the sales process. The details, significance, and impact of the recent MidOcean Partners and Pre-paid Legal Services Inc. acquisition as told by Cesar L. Rodriguez at a recent training class. 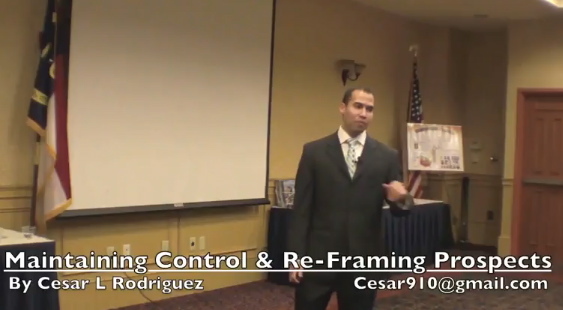 Cesar is a nationally recognized, speaker, trainer, business coach, and entrepreneurial advocate. He is the Founder &amp; CEO of http://www.ActivityTracker.com, an Executive Director with Pre-paid legal, &amp; runs a very popular blog for entrepreneurs, network marketers, &amp; those in the direct selling industry.